21st Century Poultry Breeding, By Grant Brereton. 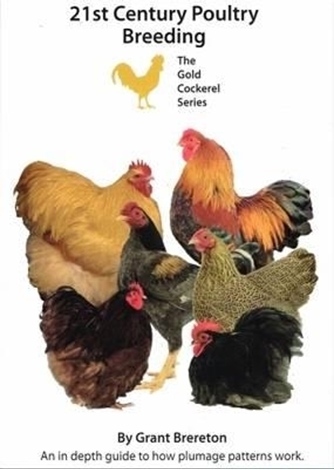 This book is an absolute must have for the poultry enthusiasts and breeders, experienced or novice. An in depth guide to how plumage patterns work with over 240 full colour photographs. This book covers a vast amount of valuable information. Whether you are looking for something to get you started or are seeking more knowledge of how plumage patterns work, this book aims to be "Dual Purpose" and serve as a general guide to poultry breeding combined with a section to make understanding the "Genetics" that little bit easier.